More than two dozen boats are expected to participate in this year’s Tugboat Roundup in Waterford. The Roundup, cancelled last year due to damage caused by the storms Irene and Lee, is organized by the town of Waterford and runs from Friday, September 7 through Sunday, September 9. Working tug boats from along the Hudson River including Kingston, Albany and Troy, from the Canal System, the Great Lakes and the St. Lawrence River are expected to converge in Waterford in time for Friday afternoon’s parade. The parade starts at the Port of Albany at 2:45 on Friday with boats arriving in Waterford as early as 5pm. 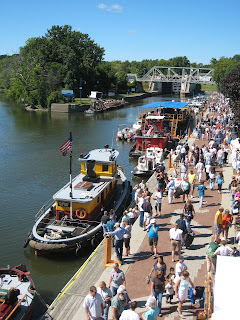 Live music will be performed throughout the event with at least nine different groups booked to play on board one of the tugs, the Grand Erie, docked in front of the Visitor’s Center along the canal at the foot of Tugboat Alley in the village. Boat tours will be offered on both the Hudson River and the Waterford locks and kids activities will include face-painting, clown performances, puppet theaters, a bouncy-bounce, pony rides. and more throughout the weekend. 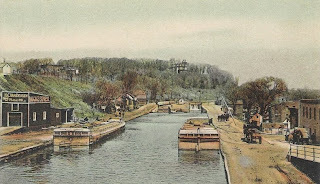 On Sunday, the American Society of Civil Engineers (ASCE) will be dedicating the Waterford flight of locks as a significant engineering achievement in America. This dedication will take place on Sunday.